How about playing at Lawrence of Arabia for the day and discovering parts of the island you would never see from a tourist bus. 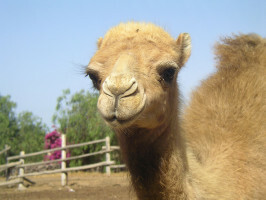 Come with us and discover the Camel Centre, situated in El Tanque in the wild north-western corner of Tenerife. 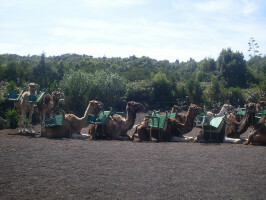 Learn all about these fascinating animals that have been used since the dawn of history on the islands gor getting around. 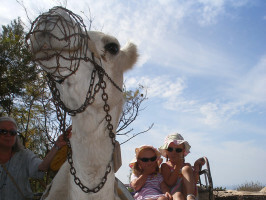 Then don Bedouin robes, climb up into the saddle and set off on the adventure of a lifetime as we explore the lush valleys and rugged volcanic mountains around the village. A trip the whole family will enjoy. The fun starts when you are picked up from your hotel, heading straight for a photo stop at Mirador de San Pedro where you can contemplate the impressive cliffs around Rambla de Castro and the rugged coastline of Puerto de la Cruz. After passing through several quaint villages on the way we will arrive at El Tanque at around 11.00. Now it's time to meet the camels and if you really wish to get into the spirit of things to don Bedouin robes and a turban. You will also have the chance to sample some traditional Canary Islands hospitality with a selection of local fare including goat's cheese, wrinkly potatoes with mojo sauce, local wine and mint tea Moorish style. From hotels in Puerto de la Cruz and the La Quinta área. Snacks such as cheese, Canarian wrinkly potatoes, mojo picón, local wine and Maghrebi mint tea.